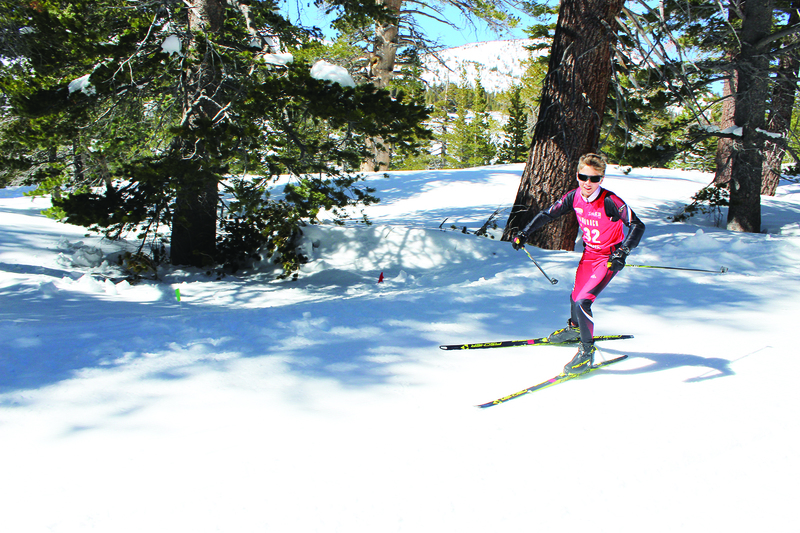 12-year-old Cyrus Creasy won the U-14 race at the Mammoth Biathlon on Saturday. FYI, biathlon is a sport that combines cross-country skiing and target shooting. Competitors in the U-14 division skied three laps around a 1.25 kilometer course, and after the first and second laps stopped to shoot targets at a distance of 25 meters, prone, with a .22 bolt action rifle designed for the biathlon. Staying cool under duress is the game. Competitors must shoot accurately while their hearts beat furiously and their lungs burn in cold air. For each missed shot they must ski a short penalty lap. Creasy didn’t just win the U-14 race; he dominated. His time of 14:58 was 3 minutes ahead of second place. Rather than sit on his laurels Creasy decided to come back two hours later and race in the U-16 division. The U-16 race was the same distance as the open adult division: three laps around a two kilometer course and two times target shooting at 50 meters, once prone and once standing. He won that too, and in the process put up the fastest time of the day for the 6 kilometer course, 23:50. The fastest adult of the day was 57-year-old Jeffrey Byberg at 25:31. So how did a 12-year-old become skiing and shooting stud? Creasy has been skiing for, in his words, “Ever since I could.” His parents would take him out in a sled that they towed behind them as they skied. Around the age of five, he strapped on his first nordic skis. He has come up through the Mammoth Middle School cross-country ski team, coached by Kathi Kirkeby. He also competes for a “Comp Team,” which travels to Far West Competitions. The Comp Team was created by Nancy Fiddler. Fiddler was an Olympian in cross country skiing for the U.S. in 1988 and 1992. She has phased herself out of coaching, but continues to volunteer with the middle and high school skiers one day a week. “Right now we have a really great group of middle school skiers who love racing and training,” Fiddler said. The middle school team finished third at the California State Championships. With six athletes on the team, they were the smallest group at the race. Tahoe teams are on average much larger than the Mammoth group. The Auburn Ski Club is massive. Mammoth also only had seventh graders competing. Creasy personally finished fifth place at almost every competition. He would lose to the same four athletes, three 8th graders, two of whom are “crazy fast,” and one of whom is Norwegian (a genetic advantage); and one 7th grader. Creasy’s short term goal is to beat that seventh grader and become the top middle schooler in the state. The mark’s name is Azure Sanchez, and he skis for Auburn. As a cross-country skier or a biathlete? Both, he says. The biathlon for Creasy is more of a side gig. He says that it’s pretty much the same as cross-country skiing. He only practiced shooting three times before the Mammoth Biathlon. He says he wants to travel to more competitive biathlons in the coming years. Coach Fiddler says that the future is bright for Mammoth Nordic. “All the kids I work with are exceptional. You could ask them to ski off a cliff and they would do it for you,” she said.